The Supreme Novices’ Hurdle is the very first race run at every Cheltenham event. It started out as a curtain raiser event, but the novices have proven to be more and more skilled over the years, eventually making it one of the festival’s signature races. The grade one competition race covers 3298 metres (2 mi furlong) over which racing horses go over eight challenging hurdles. Participating horses have to be at least four years old. The race has had its current name since 1978 when it was renamed from Lloyds Bank Champion Novices Hurdle. It’s very first title was the Gloucestershire Hurdle, adopted when it was first introduced in 1946. Thousands of onlookers gather every year to witness this first event of a hugely popular horserace. It has become synonymous with the Cheltenham Roar,’ a wild cheer from fans every time the race kicks off. The success of the festival can often be gauged from the enthusiasm of the crowd when they make this signature cheer. 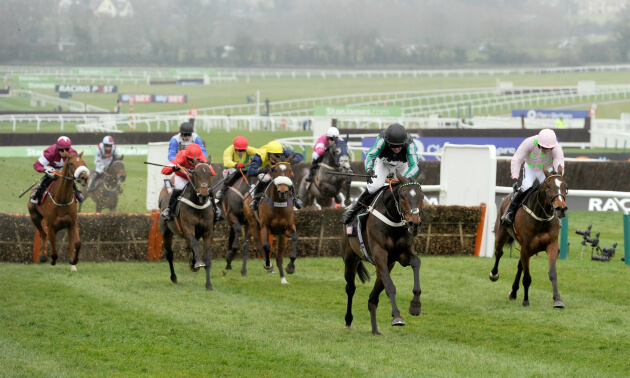 The Old Course has always been the surface for this hurdle race that is among amateur National Hunt premier events. The course has taken a galloping every year since 1946, with the exception of 1947 when the event was abandoned due to extreme snowing. Trainer Willie Mullins has dominated the race in the last two decades, with his horses taking five wins over that period to make him the leading trainer since 1972. His case has been helped by jockey Ruby Walsh who swept three consecutive wins between 2013 and 2015. Walsh himself is the leading jockey, having recorded his own five wins between 2006 and 2015. The race appears to mostly favour five, six and seven-year-old horses. No four-year-old horse has taken the first position since the turn of the 21st century, while 2002 winner Like-A-Butterfly (8 years) was the only winner older than seven years since 1966. 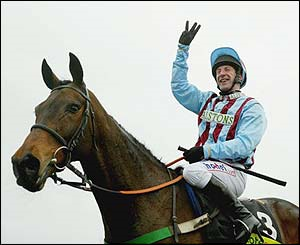 The 2004 Champion Hurdle produced a surprise, with 33/1 outsider Hardy Eustace, trained by Dessie Hughes in Co. Kildare and ridden by Conor O’Dwyer, making just about all the running and drawing away when challenged at the last flight to beat defending champion Rooster Booster by 5 lengths. The 7-year-old had won the Royal & SunAlliance Novices’ Hurdle at the previous Cheltenham Festival, so was clearly no slouch. However, connections tried first-time blinkers after a few disappointing runs and the headgear had the desired effect. Without wishing to detract from the performance of the winner, Azertyuiop, the Queen Mother Champion Chase was lessened, as a spectacle, by the departure of the reigning champion Moscow Flyer at the fourth last fence, before the race had begun in earnest. In any event, Azertyuiop ran out a ready, 9-length winner from Flagship Uberalles, with Tiutchev a further 1½ lengths away in third. Moscow Flyer can beaten Azertyuiop by 4 lengths in the Tingle Creek Chase at Sandown the previous December, so connections were left to mull over what might have been. The finish of the Stayers’ Hurdle involved the same two horses as the previous year, but Iris’s Gift reversed the form with reigning champion Baracouda – who was attempting to win the race for the third year running – to the tune of 2¼ lengths, to win by 1½ lengths. Baracouda held every chance and was upsides on the run-in, only to be outbattled in the final 100 yards. The pair finished well clear of Crystal D’Ainay, who could only keep on at one pace to finish third, 13 lengths away. The 2004 Cheltenham Gold Cup featured history in the making, as Best Mate justified odds of 8/11 to win the most prestigious race in the National Hunt calendar for the third year running. In so doing, he became the first horse since Arkle, in 1966, and just the fourth horse ever, to win the Cheltenham Gold Cup at least three times. Sir Rembrandt, an unconsidered 33/1 outsider trained by Robert Alner and ridden by Andrew Thornton, finished well to give the favourite a fright, but Best Mate held on to win by half a length.